THE PROCESS OF A COOKIE CUT TABLE — Dakota Timber Co.
We recently got a new sawmill allowing us to cut up to 5' wide live edge slabs as well as cookie cuts! These cookies make for the perfect night stand, coffee table, shelf, and so much more. We're going to show you a step by step process of what we did to make a rough sawn cookie into a unique little table and describe alternative options for you to do the same! Find the cookie cut that's right for you! 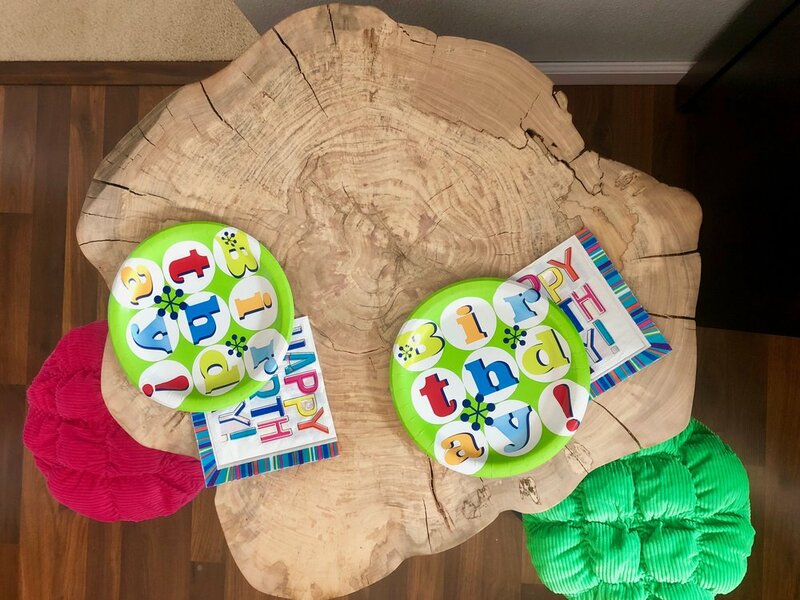 We went with this funky little rough sawn Elm cookie that was roughly 2' in diameter. 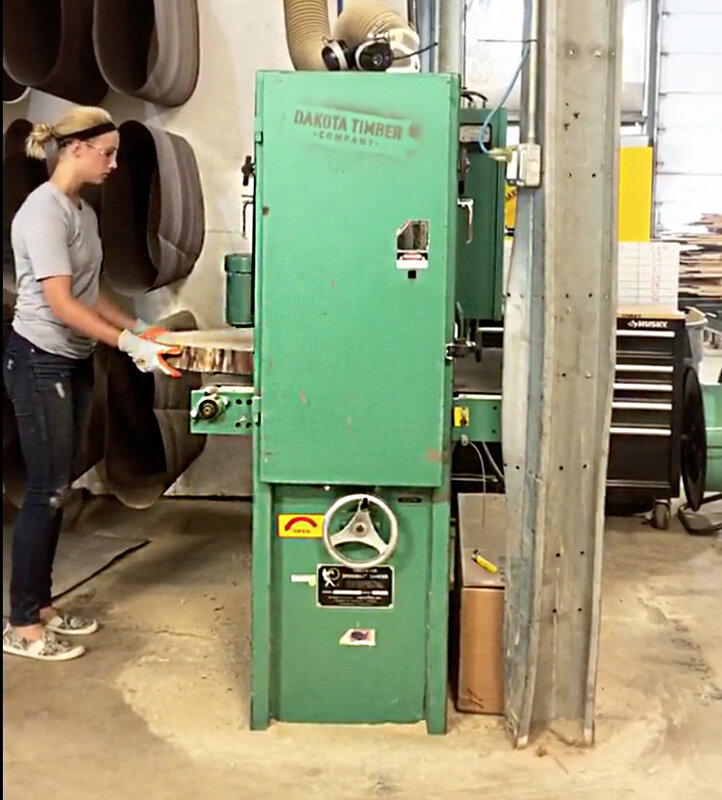 We then made many, many passes through the wide belt sander to make the cookie smooth and flat on both sides. This also made the true color show as well as the incredible figuring. You can see the difference in color and texture in the image below. The smooth cookie cut is on the left and the rough sawn cookie is on the right. 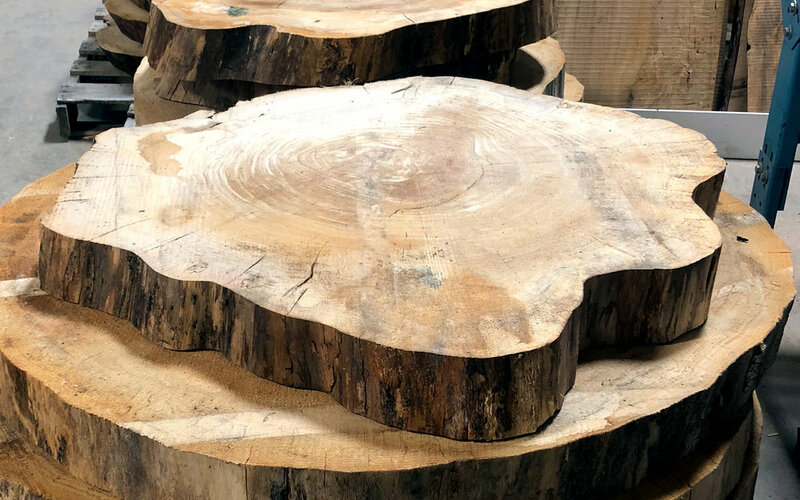 We have a hand full of each smooth and rough sawn in our showroom available for you to take a look at! If you're interested in a rough sawn one, we can smooth it down for you on site. Once both sides were completely smooth, we hand sanded the edges to smooth out the cracks and grooves as well as soften the edges. We wanted the unique figuring to stand out a little more so we sprayed a couple coats of our standard water based lacquer. This is something we can do for your purchased cookie or you can purchase a quart of our finish for a fun and simple DIY project! If you plan to finish yourself, you can use a brush to spread the clear coat on. Once the finish completely dried, we added three steel hairpin legs to complete the table. We have a few different styles and sizes of legs available for you to choose from at both our Fargo and Bismarck locations. 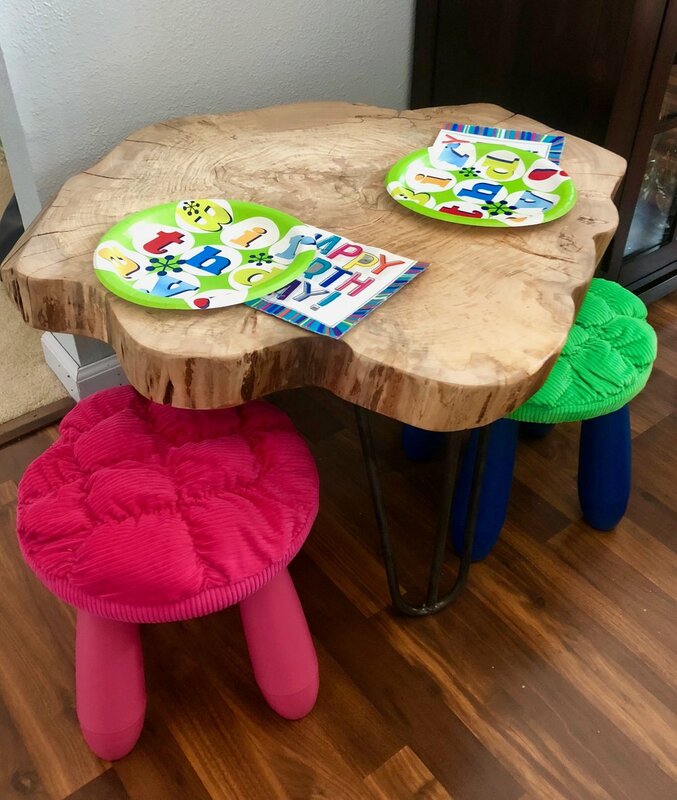 In the completed photos below, you can see this table was used for a little kids table but the options are endless for these unique pieces!